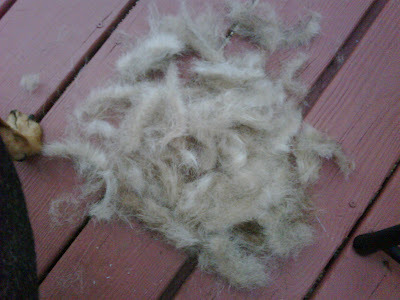 Inspired by Dooce the other day I took our generic brand Furminator to Reese the other day. These are TOTALLY worth the investment if you do not have one. Now I tried to get Riley to pose next to the giant pile of hair, but he looked at me all appaled and wouldn't go near it. Reese on the other hand tried to eat it, she does this with her nail clippings as well.